We are surrounded by cryptography, from the ATM, where we withdraw cash, mobile phones, and the Internet, to workplace security systems that protect business secrets, and the civil and military codes that protect the skies above us. 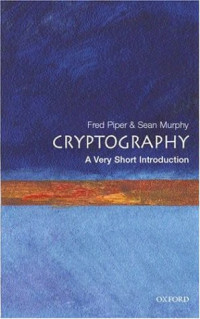 In this fascinating introduction to how cryptography actually works, Fred Piper and Sean Murphy highlight its all-pervasive impact on modern society. Tracing the major historical developments in cryptography to many present-day examples, which readers can sample themselves, such as creating digital signatures, this Very Short Introduction demystifies the art of cryptography, highlighting the considerable social and political, as well as practical, importance of data protection and authentication in the modern world. Fred Piper has been a professor of Mathematics at the University of London since 1975 and has worked in security since 1979. In 1985 he formed a company, Codes & Ciphers Ltd., which offers consultancy advice in all aspects of information security. He has lectured world-wide on a wide range of topics in information security, both academically and commercially. He is currently Director of the Information Security Group at Royal Holloway, University of London. Sean Murphy is a Professor in the Information Security Group at Royal Holloway, University of London. His research interest centre on cryptology, escpecially encryption algorithms. He published some of the early papers on differential cyptoanalysis, and has written papers on a variety of cryptographic algorithms. This book constitutes the thoroughly refereed post-proceedings of the 7th International Bi-Conference Workshop on Agent-Oriented Information Systems, AOIS 2005, held in Utrecht, Netherlands, in July 2005 and in Klagenfurt, Austria, in October 2005.